Myesha D. Jenkins requires a $10 “donation” for her book reviews. Though I thought it was kind of backhanded and shady, I really tried to view her fee in a positive light and was desperate to have someone outside my “network” read my work. Who does anything for free except me, right. Ten dollars isn’t really that big a deal, right. My friend, “Shay”, seemed very disappointed in me for paying her and thought I was rushing too much into trying to expose my work. I wish I’d talked to her before I did it so she could talk me out of it. To top it off, my friend, “C”, just told me that Jenkins rated me two stars on Goodreads. Of course, I didn’t know this until a few minutes ago because I wasn’t going to read the Jenkins review until I finished the second book. This has been a really bad day. That week a lot of people hoodwinked me because I know how hard it is for Black women writers to get recognized, or read at all, and I was convinced the only way for me to get exposure was to push for it through any means possible, even using my birthday money to pay for this review. I probably lost like $50, including this. If that’s really all she thought of the book, I accept that. But I feel a lot of regret and shame for paying her to read it. Its something I won’t be doing again, not with her or anyone else. I feel so stupid and embarrassed because that particular review (the only so far) wouldn’t be there if I hadn’t sought this lady out and paid her. It probably won’t be the last bad review and if people really think my work merits two stars or less they should be honest about it like her, but I shouldn’t be walking into two-star reviews, especially paying for them with money I don’t really have to spare. Its better to let people come to your book of their own accord. Don’t pay them. Don’t coerce them. Don’t try finesse them into it. I knew that and still I let fear and misguided ambition lead me to do something like this. Its done now. Lesson reinforced. Atlanta, Ga. June 16, 2014 —Atlanta native and author, S.T. Rucker, has published Path of the Righteous, a speculative fiction novel that follows bibliophile Dahlia En’te into a world of demons, faeries, and angelic beings of creation, after she discovers herself entrapped in the political schemings of human men. Many readers and writers of fantasy, science fiction, and other genres and combinations under the speculative fiction umbrella expect writers to encourage a suspension of or ignorance of lived experiences with racism, classism, and heterosexism or politicized worldviews like feminism and womanism or fat acceptance—Path of the Righteous promises no such thing and neither does Rucker for her current and future publications. Dahlia goes from working class girl living in an impoverished community who just wants some good books to read to sacrificial offering to human-eating demons in the deep woods—and its not the end for her. Through her journey, we experience wonder, beauty, and magical locales, we see young people facing difficult truths, finding empowerment, embracing their humanity and potentiality, and trying to deal with how generational ignorance and systemic oppression causes the suffering of everyone around them. 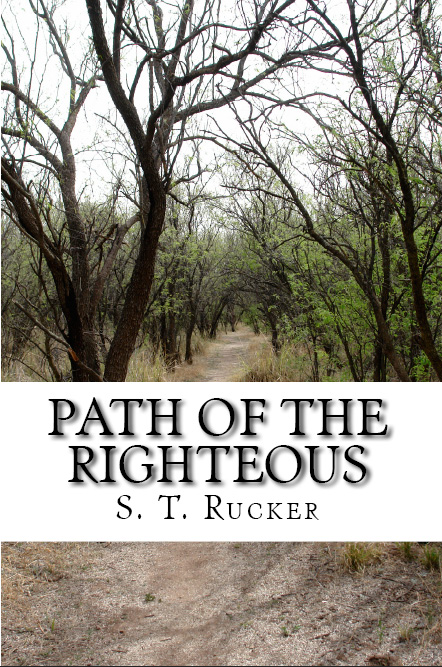 For a limited time (Monday, June 16 through Saturday, June 21), an electronic book version of Path of the Righteous, normally priced at $3.99, will be available to the public with 50% percent off at https://www.smashwords.com/books/view/448767 using the following coupon code: SX67B. Originally from Atlanta, S.T. Rucker moved to Fresno, California shortly after graduating from Seattle University. An almost English/Creative Writing and Sociology double major who thought she’d never be published, she heard about Smashwords from a friend and embraced independent publishing to share her stories and vision with the world. She is the author of The Taker and Acier, available on Smashwords. For more about S.T. Rucker visit her at about.me/s.t.rucker, on Facebook and Twitter, and read her Smashwords profile . A lot has been going on since my last post here at Sepia Heaven, including the passing of my grandmother. Path of the Righteous is a story that begins, depending on how you look at it, with a girl who just wants to read some books and it seems her thirst for knowledge has led her into a bigger trap than she realizes at first. I like the story because though Dahlia’s journey is harsh, it takes her to fantastic places and in the end she comes out stronger than any of her adversaries or obstacles. Path of the Righteous is set to be my first full-length novel and I haven’t completely read through it for some cursory editing. I’d like to have a professional do it but hesitation and doubt just keeps winning in addition to literally not having the money to pay anybody to take the time to review and/or look over my writing. I have some inkling as to how to begin looking for an editor if I really want one and feel its necessary. I just want my first book to be kind of shiny and polished I guess. In addition to living in an environment that’s counterproductive and sometimes even toxic to my writing process, I also want to roll out the book with professional cover art (more money) and a press release letter and everything. Though I want these things, I feel bogged down by my own ever-mounting delusions of grandeur that then collapse right back into the fact that I haven’t even finished editing yet and every time I look back at what I’ve already done, I see something new to edit. Something different to “fix”. There’s also an investigation into continuity with the sequel and a scene or two I’d like to add to Path of the Righteous (Book I) itself..
I’m so indecisive and emotionally and mentally constipated about the whole thing by now that I’m considering compiling a book of short stories to publish first instead. But why? I think the reason is because it would take me even more time to write and compile those short stories, thereby preventing me from publishing anything for an even longer amount of time. Self sabotage. Doubt. Uncertainty. Attempts at perfectionism. The truth is I just want to publish the damn book and forget about all this other stuff in my head. Shove it out there, edit as I notice stuff. Nothing like the pressure of sticking the book out there and trying to change typos and other editing issues before anyone else sees them, hahaha :-D. I don’t want my readers to have a potentially bad experience but this maybe the only way I can get anything out there without drowning in anxiety/panic attacks every five seconds and succumbing to procrastination and other forms of self-sabotage. I’ll work through this, so please look forward to seeing Path of the Righteous on Smashwords in ebook format and available in hard copy probably on Lulu soon. I’ve been in the clouds recently filling orders from my almost-small-business and I’m coming up on the deadline for an offer from NaNoWriMo to its winners to get a supposedly free first edition of one of my manuscripts from Lulu.com.. I have three or so manuscripts that are unfinished but novel length. Path of the Righteous (Book I) is the one I chose. Though I know that not everyone thinks like me, I’m “selling myself short”, and should stop giving things away for free (which is also a problem I’m having with my quasi-small business–not charging people what I feel I deserve to be paid for my art crafts). In addition, I am also releasing a special Valentine’s Day novella–Cat Eyes (one of my older works). More on both books coming soon.